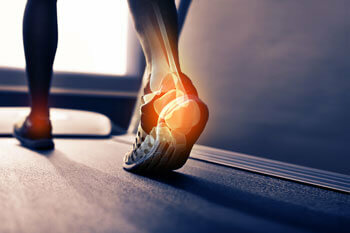 Ankle sprains are one of the most common injuries we see as physiotherapists. The ankle is fairly susceptible to injury when playing sport due to the level of forces that are transmitted through the joint between the body and the ground. The ankle is a fairly mobile joint made up of three bones. The ligaments surrounding the joint are responsible for maintaining the stability of the joint. The ligaments on the inside of the joint are generally stronger and less likely to be damaged than those on the outside. If the foot is grounded and the weight of the person is moved laterally (away from the midline of the body), the outside ligaments will be damaged if the force is strong enough. This is known as an inversion sprain and is the most common type. The degree of damage will depend on the strength of the ligament to begin with (the more sprains, the weaker the ligament) and the force that was applied to the ligament. As with all ligament sprains the RICE protocol should be followed. This stands for REST, ICE, ELEVATION, and COMPRESSION. Physiotherapy can be very beneficial in the initial stages in reducing the amount of inflammation and maximising the rate of recovery. Techniques such as ultrasound and interferential therapy, mobilisation of the ankle joint, taping to support the joint and advice on activity level and exercise are all crucial in the initial stages. The recovery time will be proportional to the degree of damage done and your physiotherapist will be able to advise you on this. It is also important to strengthen the joint so as to prevent injuries from reoccurring.